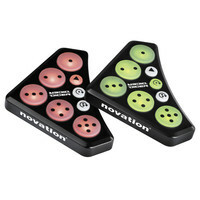 The Novation Dicer is a palm-sized cue point and looping controller that has been designed to fit exactly where you need it: on your turntables CDJs mixer or laptop. Dicer works with almost any DJ software and is optimised for use with Serato Scratch Live Traktor Scratch Duo/Pro and Traktor Pro. Browse through playlists nudge tracks backwards and forwards trigger samples cue-points loops and FX with this compact controller featuring coloured LEDs to tell you what mode youre in. Dicer always ships in pairs – one for each side.